Brooks Engineering Associates (BEA) provided the initial boundary and topographic surveying for a subdivision owned by the Eastern Band of Cherokee Indians. 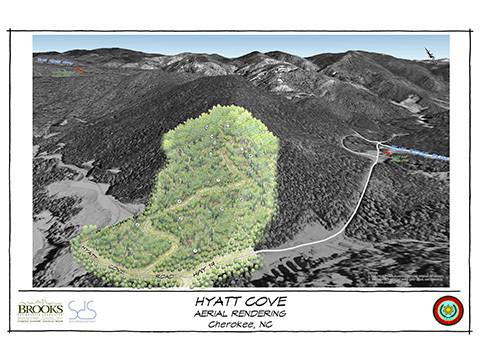 BEA then worked closely with the Housing Division and tribal leaders to create a land plan that was sensitive to the environment, and would not negatively impact the viewshed from the nearby Blue Ridge Parkway. BEA then worked with Site Design Studio to provide 3 dimensional renderings, and sample views from key Parkway overlooks to get approval for the land plan. Once the land plan was approved, BEA provided engineering for the road system and a water line which required a booster pump and storage tank. BEA provided construction administration services as well as construction staking for the project.